Independence Day Ball Invitation from the collections of the Worthington Historical Society (WHS) may be used for educational purposes as long as it is not altered in any way and proper credit is given: "Courtesy of the Worthington Historical Society, Worthington, OH." Prior written permission of the WHS is required for any other use of Independence Day Ball Invitation. Contact WHS at info@worthingtonhistory.org to request permission. Independence Day Ball Invitation is text. Its dimensions are 3.09 in. x 4.25 in.. It was created on Monday, July 5, 1813. 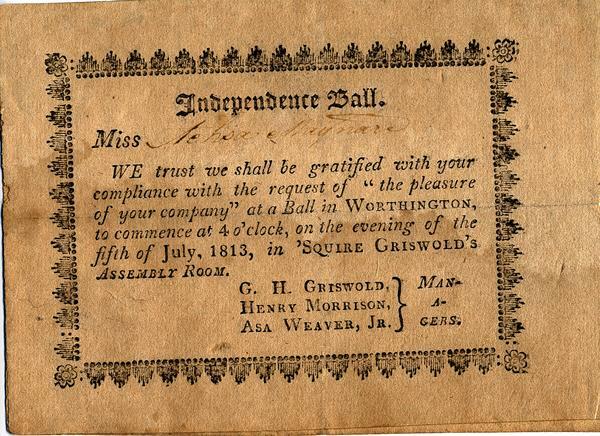 This invitation to an Independence Ball in celebration of Independence Day at the Griswold Inn was sent to Achsa Maynard (b. 1791, d. 1882). The hosts of the party were George Harlow Griswold, Henry Morrison, and Asa Weaver Jr. In 1815, Achsa married Orange Johnson, a comb maker who migrated to Worthington from Connecticut in 1814. It covers the topics dance, Fourth of July, Griswold Inn and balls (dance parties). It features the people Achsa Johnson (née Maynard), 1791-1882, George Harlow Griswold, 1795-1876 and Asa Weaver, ?-1842. The Worthington Historical Society identification code is 77-G-695.02. The Worthington Memory identification code is whs0840. This metadata record was human prepared by Worthington Libraries on October 19, 2005. It was last updated November 13, 2017.